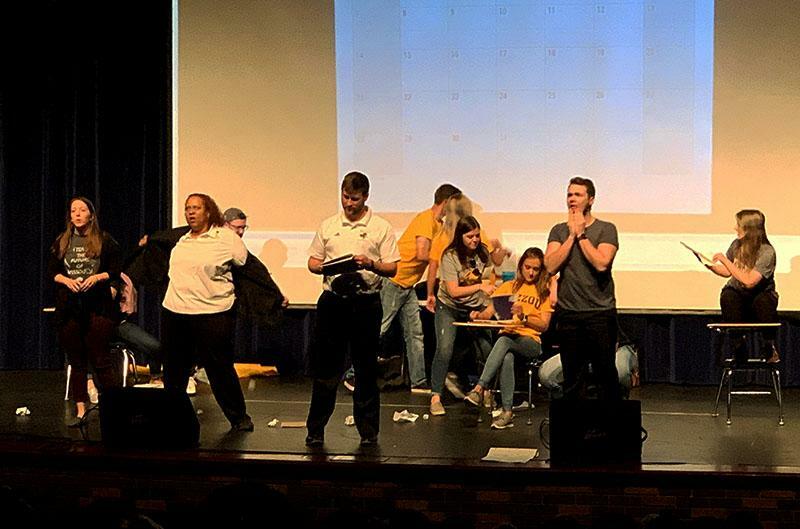 The annual Como Cow Lip Syncing competition took place April 3 in RBHS’ Performing Arts Center (PAC) where RBHS, HHS and BHS fought for the title of best lip syncers. The profit made went to charity. Both students and teachers represented their respective schools as they performed choreographed dances. From artists like early 2000s R&B group Destiny’s Child to more current hits, the PAC was filled to the brim with rhythm, ecstasy and anticipation. In the midst of all this excitement, local charity Children’s Grove was able to fundraise. The organization focuses on promoting kindness and creates a more accepting and open environment for children around Columbia. The organization spawned after the 2012 shooting at Sandy Hook Elementary School in Newtown, Conn., and since has planted a grove of trees commemorating those who were murdered that day. Senior Madison Hopper has been involved with the charity since her freshman year. She is now a Youth Kindness Ambassador. She was ecstatic to learn that Como Cow chose to donate the profits towards Children’s Grove and in turn fostering a kinder Columbia. As the evening continued, teams from each high school went up on stage and presented routines. Sophomore Lola Gingrich, along with several other students in Madam Kristen Reed’s French class, performed several French pop songs, all under the alias, The Croissants. To Gingrich, doing Como Cow was an opportunity to show students French culture, to hang out with friends and to create something unique. The night was full of many great performances, but only one group could win. ‘Gen Z,’ a group led by senior Aubrey Sanders, danced to hits from the late 90s to the present, all in jean jackets. Junior Mary-Kate Grossman was a member of the winning group as well, and for her, winning the competition and taking home the award for RBHS was the best part of the night. No matter who won, for Hopper, all the groups had something in common. They came together as one Columbia all under one roof, and had a wonderful time while doing so. In the end, the most important thing to her is what the event fosters among CPS’ students from all three high schools. “Como Cow is one of my favorite events of the year, and it’s really cool because it brings all the student councils from each school together,” Hopper said. “It’s cool that we get to collaborate in this competition and just have fun together. Como cow was one of the more entertaining school performances I’ve been to and I’m definitely planning on attending next year! It surprised me how much people worked on choreography and how good the dances were! The competition was entertaining and I really enjoyed it!